Save an extra CDN$ 7.00 (35%). Buy the Kindle Edition instead. Comment: Ships direct from Amazon! Eastern Europe, 1944: Three women believe they are pregnant, but are torn from their husbands before they can be certain. Rachel is sent to Auschwitz, unaware that her husband has been shot. Priska and her husband travel there together, but are immediately separated. Also at Auschwitz, Anka hopes in vain to be reunited with her husband. With the rest of their families gassed, these young wives are determined to hold on to all they have left—their lives, and those of their unborn babies. Having concealed their condition from infamous Nazi doctor Josef Mengele, they are forced to work and almost starved to death, living in daily fear of their pregnancies being detected by the SS. In April 1945, as the Allies close in, Priska gives birth. She and her baby, along with Anka, Rachel, and the remaining inmates, are sent to Mauthausen concentration camp on a hellish seventeen-day train journey. Rachel gives birth on the train, and Anka at the camp gates. All believe they will die, but then a miracle occurs. The gas chamber runs out of Zyklon-B, and as the Allied troops near, the SS flee. Against all odds, the three mothers and their newborns survive their treacherous journey to freedom. On the seventieth anniversary of Mauthausen’s liberation from the Nazis by American soldiers, renowned biographer Wendy Holden recounts this extraordinary story of three children united by their mothers’ unbelievable—yet ultimately successful—fight for survival. 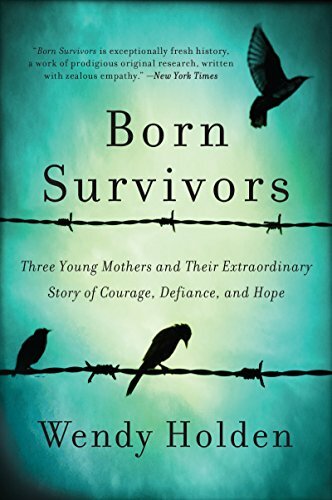 Start reading Born Survivors on your Kindle in under a minute. Among the millions of Holocaust victims sent to Auschwitz II-Birkenau in 1944, Priska, Rachel, and Anka each pass through the concentration camp’s infamous gates with a secret. Separated from their husbands and strangers to one another, they are pregnant and scared. After losing so many other loved ones to the Nazis, these women are determined to hold on to all they have left: their lives and those of their unborn babies. 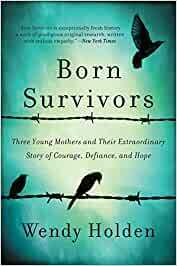 Born Survivors follows them as, against all the odds, they give birth to their babies and go on to build new lives with their children after World War II. Theirs are stories of hardships and miracles as they narrowly escape the clutches of Dr. Josef Mengele at Auschwitz; conceal their condition after they are sent to a Nazi slave-labor camp, where they are half-starved and almost worked to death; and as the Allies close in, survive a seventeen-day train journey to Mauthausen in Austria. By the time they arrive, all three babies have been born—but because the camp has run out of Zyklon B, their lives and those of their mothers are saved. Sixty-five years later, the three “miracle babies” share a remarkable, inspirational story of three mothers who defied death at the hands of the Nazis to give their children life. I have read several stories about the Holocaust survivors & if I did not already know it was real I would have to say what these three women survived was so horrific that it was impossible! As soon as I began their stories I felt spellbound to keep reading ! Not only survival but triumph over such adversities! A well written account of man's brutality! Fantastic account. Makes one realize that the world and some people in it are lower than low. The woman were totally courageous and had a will to keep living and this is what kept them strong. I just wish that they had known each other while in prison. They would have found strength in each other. The beatings they endured was outrageous but the cold was the worse. I , myself am a " Survivor" of my childhood and therefore drawn to stories of childhood abuse of different kinds. This story will warm your heart and have you anxious to turn the next page. Bless these children of courage and resilience beyond their young years. Awesome book on a horrible life lived! I would highly recommend this book. A book you will not be able to put down. The three women in this book exemplify the strength of the human spirit...very inspiring. An amazing novel of love, perseverance and strength amid the most horrific conditions. I have already recommended it to several people. what an eye opening book .I felt so emotional reading this book that i had to keep Kleenex near by.